The Bandicam MPEG-1 codec is a Direct Show Filter to playback/edit the captured video with Bandicam or Bandicam Capture Library. 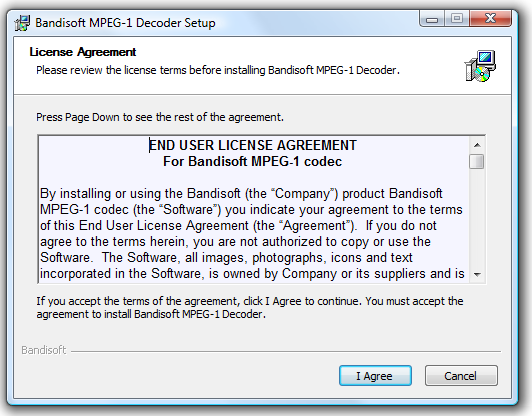 Bandicam MPEG-1 decoder is freeware. You can freely install and redistribute it unless you reverse engineer, decompile or disassemble the software. This package supports silent installation by using the /S option. It automatically upgrades without the need of an installation menu. It compresses video files up to 5 times more effectively than the MJPEG codec, because it compresses video files using motion compression. The MPEG-1 codec is a well-known codec, and many UCC sites support the MPEG-1 codec. Unfortunately, Windows’ internal codecs can't handle high resolutions, higher frame rates, and frame skipping. You should install this codec to edit or play MPEG-1 video files. The unified codec pack also supports MPEG-1 video/audio files. But it is too heavy because other unnecessary codecs are also installed together. The Bandicam MPEG-1 codec only installs minimal codecs to play files encoded with the MPEG-1 codec.